Delicious deep maple flavored gluten-free vegan maple cream cookies with a natural maple butter filling. Oil-free and refined sugar-free. Process all cookie ingredients in a food processor until the mixture begins to form a ball****. Form the mixture into a ball with your hands and knead briefly, then flatten into a disk. Place the disk between two sheets of parchment paper on a flat surface and use a rolling pin to roll out into an ⅛” thickness. 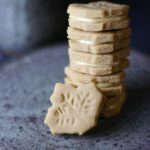 Use a maple leaf cookie cutter to cut out as many cookies as you can — carefully transfer those onto the prepared cookie sheet. Gather remaining dough scraps, form into a ball, and repeat the process of rolling out and cutting out more cookies until you run out of dough. Note: I got about 30 2″ cookies, which makes 15 sandwich cookies. Optional step: if your cookie cutter doesn’t have leaf details on it and you’d like those, use the end of a spoon handle to create indents in each cookie to mimic the veins of a leaf. Or can just leave the cookies plain. Bake in a pre-heated oven for 9 mins (or bake longer for slightly crispier cookies to your liking, just keep an eye out that they don’t burn). Remove from oven and allow the cookies to cool a few minutes (they will seem on the soft side at first but will firm up a bit as they cool off). Once the cookies are fully cooled off, flip one cookie upside-down, place about a third of a tsp of maple butter in the center of it. Cover with another cookie and press down to make a sandwich. Be careful not to overfill the cookies so the filling doesn’t spill out over the sides too much. Enjoy! *See notes above recipe re: using cassava flour for a grain-free alternative. **I recommend going with a dark or very dark maple syrup if possible for a deeper flavor. But if you can’t find that, then regular maple syrup will work fine too. ***Maple butter should be made of 100% maple syrup. ****The texture of the dough can be different depending on the cashew butter used. For example sometimes you might get a batch that’s more “oily” other times one that’s more dry + brands vary, etc. The dough should be soft and pliable. But if the mixture feels too sticky at this point, add a bit more flour and process again to incorporate; if too dry, add a bit more maple syrup or cashew butter. I just add a tsp of flour at a time, for instance, until the consistency is just right (which usually takes just 2-3 tsp more flour).